In Summoner Wars: Alliances, this battle has been brewing for a while now — two battles, actually, now that I think about it. Sure, it’s the fight between the Deep Benders, which I suspect is a sort of yoga squat, and the Sand Cloaks, which sounds bonkers itchy. Just shake them out, y’know? And stop tracking all that sand all over the carpet. More importantly, it’s the fight between Somerset and Dan. A fight that will leave only one of us left standing. Or at least a fight that will break our stalemate. It was inevitable that I would do a review of Plaid Hat’s latest and greatest, Summoner Wars: Alliances. Not here, however. Oh no. Over at the Review Corner, see. What’s the Review Corner? Well, it’s like that graffiti-encrusted spot sandwiched between the high school gym and the auto shop. We ditch class, smoke cigs, and trade reviews of board games, eyes peeled all the while for the school cop to come rumbling over in her golf cart. The folks over there were nice enough to ask if I’d do a review now and then, and I answered with a resounding “Okay.” The rest, as some people say (not me), is history. You can find the review over here. 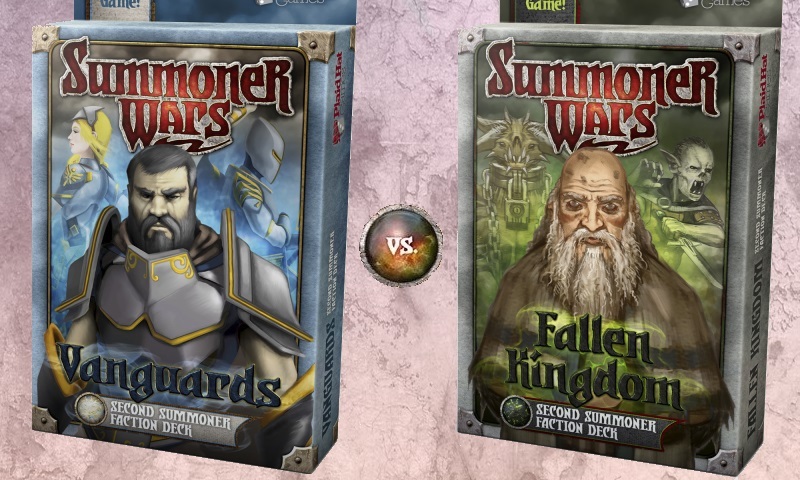 As the next phase in the Summoner Wars continues, with alliances being struck between the sixteen previously-disparate factions, what do you get when the undead Fallen Phoenix invade the lands of the Swamp Mercenaries? Whatever else it may be, it’s going to be stinky. Deals have been struck. Some benevolent, some… well. It was always inevitable that once the Summoner Wars began in earnest, the sixteen factions who found themselves in possession of summoning stones would seek alliances, no matter how desperate or ill-motivated. And when it’s between the Tundra Guild and the Cave Filth, that’s one fight you sit back and let run its course. We’re all sick of zombies, right? I mean, unless you’re one of the hundred million people who keep buying all those zombie-themed games, the ones with the ludicrous quantity of undead minis, and the dice games, and every single thing with a dismembered hand on the cover, the zombie thing feels pretty played out? I understand. And I agree. Zombies have run their course. Down with the undead. Long live the living. But you’re going to have to take my word on this one: Dead of Winter from Plaid Hat Games is another game with zombies in it, but even so, it’s pretty much the best game of 2014. So buckle up, keep that shotgun close at hand, don’t trust anyone with a bleeding bandage on their arm — no matter how many times they insist they just snagged it on a broken window — and get ready to see how good a zombie game can be. Poop just got nonfictional. I’ve always preferred an assassination strategy in Summoner Wars, and now two of my three favorite factions — both of whom are among the slipperiest, most low-down assassins of all — have just received their second summoners, and entire sacks of tricks, traps, and mean horribleness to go along with them. This time, the nomadic Cloaks and the probably-also-nomadic Jungle Elves are having a go, and their appearance on my doorstep means another duel with Somerset. 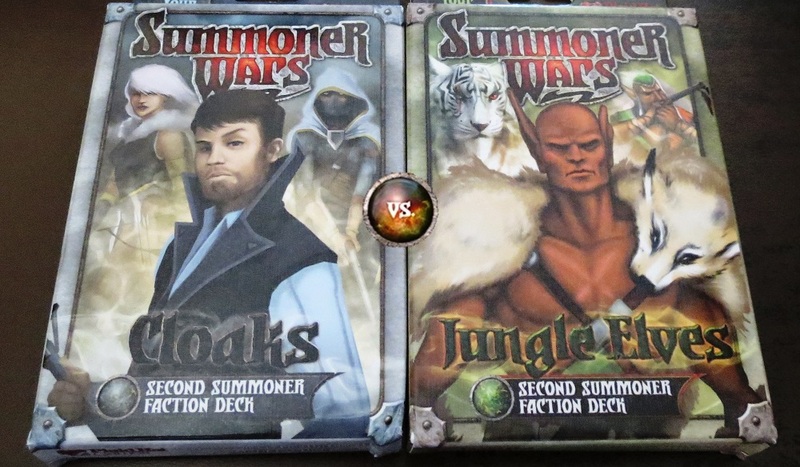 Summoner Wars is so full of bitter rivalries that it could be about pro wrestling, but all of them pale in comparison to the conflict between the sickeningly rotten Fallen Kingdom and the sickeningly noble Vanguards. Now, with the appearance of an additional summoner on each side, these two factions are once again squaring off on the battlefield — which means Somerset and I are squaring off again too.